Empire Barbering & Beauty Co. Empire is Saskatoon’s premiere full service Aveda Lifestyles Barbering & Beauty Company. All created in a beautiful loft space in the heart of YXE. 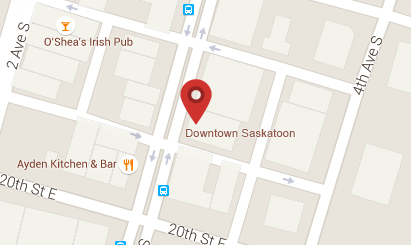 On Sunday mornings, we gather at the Galaxy Theatre on the corner of 2nd Ave. and 20th St. in downtown Saskatoon. There is plenty of free parking on the street in front of the Galaxy. Our gatherings start at 10:15 AM and last until noon. As an historic downtown Church, we are rooted deep in Saskatoon and celebrate the diversity of our membership. We are challenged by our special location to address the concerns of the Inner City in fellowship with churches of other denominations around us.